Sir Winston wasn't the only Churchill to sail aboard the Queen Mary. On this day in 1948, his son, Randolph Churchill, was traveling home to England aboard the Cunarder. While in the States, the author and lecturer had appeared on Meet the Press. 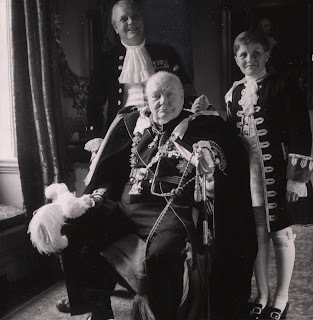 He's pictured here a few years later with his father, who was once again prime minister of England, and his son, also called Winston.